York Nordic poles are a high quality walking poles that combine innovative features with stylish design. 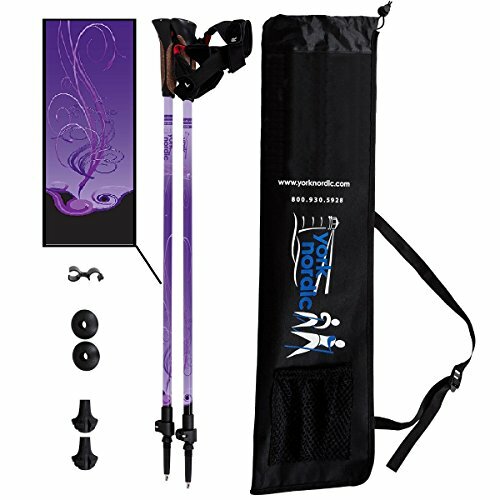 Poles are made from high grade 7075 aluminum and feature our fun "Purple Haze" design that brightens any day. Your choice of 2 grip styles. Trek Grip: The contoured foam supports your hand and fleece lined strap provides great wrist support. Perfect for variable terrains. The bottom of the grip has an extended foam grip area that provides extra grip at a lower point on the pole for steeper trails. Nordic Cork Grip: Easy click out release glove style strap maximizes pole control and push while allowing you to quickly release from the pole when needed. Our grip is thicker than traditional Nordic grips making it more comfortable. Strap has a specially designed end that makes it easier to get the strap secured with less frustration. Every order includes free access to an online instructional videos. The Company was founded by certified Nordic walking instructor Lauren DeLong. Based on the seacoast of New England, the Company combines world class sports engineering with the unique design styles of our artists. All products are designed and manufactured in the US with US made and imported components. Final assembly is done in Portsmouth, NH. HIGH QUALITY WALKING POLES: 2 pack of adjustable walking / hiking / trekking poles with your choice of Hiking/Trek or Nordic style grips and bold purple design. Better than walking sticks or canes. Makes a great gift for women or men. Great 5 year warranty! ULTRA LIGHTWEIGHT: Pairs are high quality aircraft grade 7075 aluminum with tungsten steel tip. Light and more stable than carbon fiber. Provides better stability when walking or hiking. Each pole only weighs 8 ounces!